Miss De Meena has been built to a very high specification for comfortable living for her present owners. Both inside and outside. The boat reflects well on the owners as the condition would be hard to fault.At the bow is the self contained bedroom taking up the full width of the boat due to the enclosed bow. The bedroom has wardrobes, dressing table and overhead lockers. A set of side doors with neatly built in steps give easy access. A walkthrough bathroom has a quadrant shower, sink in vanity unit and Thetford china bowel toilet. Open plan saloon with a corner set multi fuel stove. A TV cabinet with shelves either side is mounted below the gunwale. Dinette area with extending seating for guests. A well laid out galley has units with corian work tops .Useful touches such as the magic corner and full height pantry cupboard provide excellent storage. Viewing recommended. 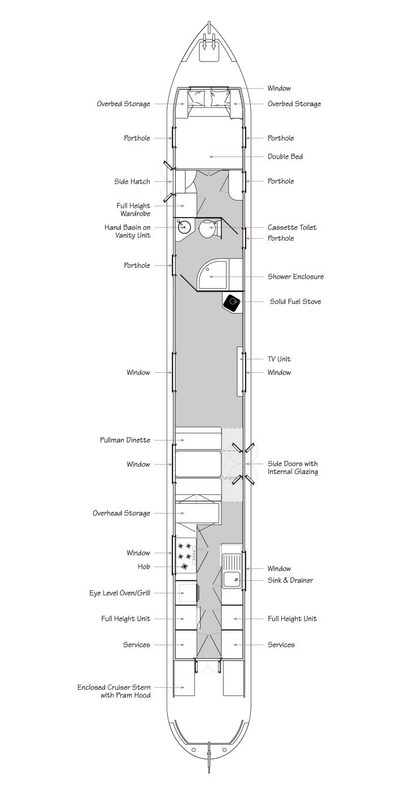 Notes: A Pullmans dinette which will seat 6 comfortably due to the ability to extend the table and seating.This area will also convert into sleeping guests.Saloon with multi fuel stove and built in under gunwale TV unit.All windows are double glazed.LED'S throughout. Notes: Well appointed galley at the stern with eye level oven, washing machine,and space for a microwave .The work tops are corian.Avery useful floor to ceiling cupboard with drawers to one side of the oven.A magic corner makes maximum use of the cupboard space.There is a space for a microwave. Notes: Walk through bathroom with quadrant shower, sink in vanity unit and Thetford china bowel cassette toilet. Notes: Large forward bedroom with a full width of boat bed, wardrobes , dressing table and overhead lockers. A set of side doors with steps provide an access point. This is a very private room.